All aboard for a fun, interactive playtime experience with Thomas & Friends! 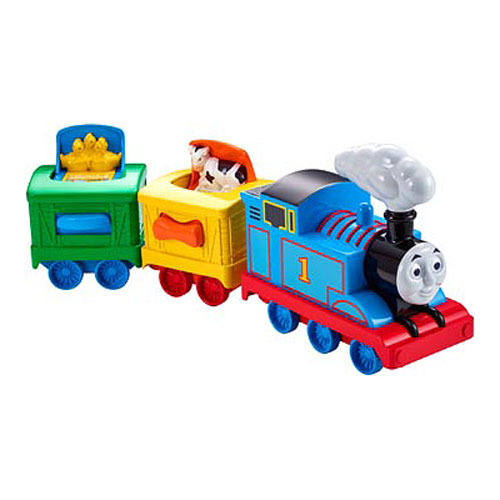 The Thomas and Friends Thomas Activity Train Vehicle from Fisher-Price lets your child join Thomas on a fun-filled farm delivery. Swivel the button on the first cargo car and a cow pops up with a bell sound effect. Press the slider down on the second car and an adorable nest of chickens pops up with a peep sound effect. Roll Thomas and his cargo cars along and spin his steam cloud to hear a clicking sound. With features that promote eye-hand coordination and discovery, the Thomas Activity Train engages children's senses and stimulates their imaginations! The set includes Thomas and 2 Troublesome Trucks that are permanently attached together, but have pivot action. Ages 1 and up. Batteries not required. Assembly required.